Raise your children for Christ AND enjoy the journey! We're the homeschooling parents of seven children, currently living in rural Indiana. 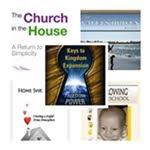 Our heart is to encourage and equip Christian parents to "make the most of every opportunity" for the Kingdom, so our ministry encompasses child training and discipleship, home management, homeschooling, ministry, and more. We have many informational articles available on our Web site, www.ValuesDrivenFamily.com; while you're there, be sure to sign up for our bi-weekly e-newsletter and get 8 weeks of helpful FREE gifts, including audios, ebooks, and more! Values-Driven offers 15% off Beeyoutiful everyday! Spiritual Growth, Discipleship, Kingdom Expansion, and more! Be sure to click over to our Web site, www.valuesdrivenfamily.com, for FREE DOWNLOADS that are designed to help you balance the demands of life and family and experience God's best. All content copyright (c) 2010-2016 Values-Driven. Simple theme. Theme images by A330Pilot. Powered by Blogger.